When California girl Susan Murphy is unwittingly clobbered by a meteor full of outer space gunk on her wedding day, she mysteriously grows to 49-feet-11-inches tall. The military jumps into action and Susan is captured and secreted away to a covert government compound. There, she is renamed Ginormica and placed in confinement with a ragtag group of Monsters: the brilliant but insect-headed Dr. Cockroach, Ph.D.; the macho half-ape, half-fish The Missing Link; the gelatinous and indestructible B.O.B. ; and the 350-foot grub called Insectosaurus. Their confinement is cut short, however, when a mysterious alien robot lands on Earth and begins storming the country. In a moment of desperation, the President is persuaded to enlist the motley crew of Monsters to combat the Alien Robot and save the world from imminent destruction. No, not another Aliens movie but the upcoming computer animated flick from DreamWorks Animation (Shrek, Bee Movie). Monsters vs. Aliens reinvents the classic ‘50s monster movie into an irreverent modern day action comedy. With the earth under attack by an unstoppable alien, it’s up to the monsters — (top to bottom in pic below) Insectosaurus; Ginormica (Reese Witherspoon); Dr. Cockroach, Ph.D. (Hugh Laurie); the Missing Link (Will Arnett); and B.O.B. (Seth Rogen) — to overcome their misfit status and save the world from the pending imminent destruction. 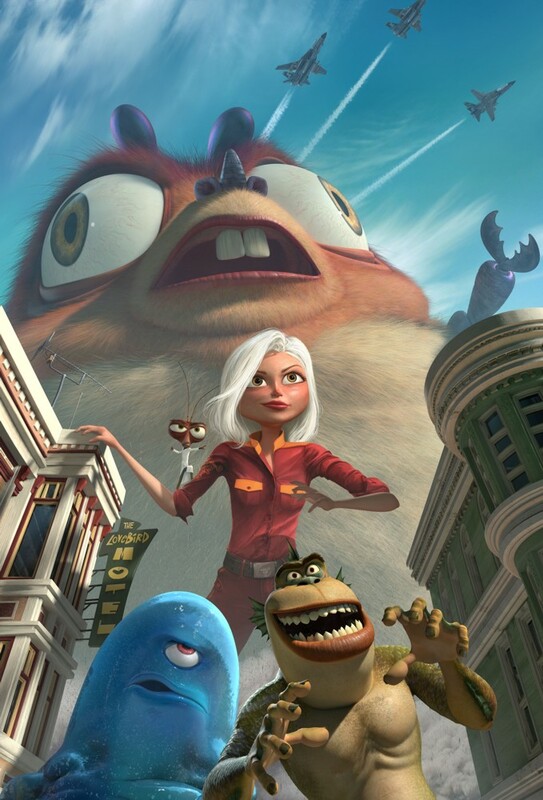 Monsters vs. Aliens will be the first DreamWorks film shot in digital 3-D.
"I believe that next generation 3-D will make our CG films even more special and unique," Jeffrey Katzenberg, Chief Executive Officer of DreamWorks Animation told the media recently. "We are thrilled to have Monsters vs. Aliens as the first opportunity for audiences to enjoy this exciting new movie experience. Moving to a March release date, which has proven to be a great slot for family films, allows us to roll out our first 3-D project on the maximum amount of screens as the year's first big event film to hit the market in this new format." 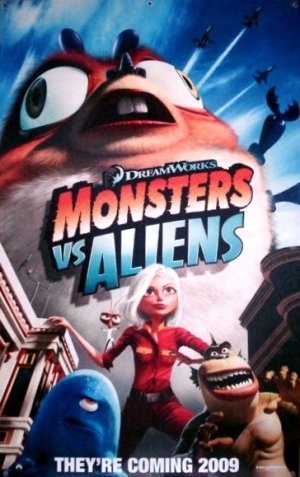 "We are really excited to be distributing Monsters vs. Aliens, the marriage of a new technology with the classic family entertainment audiences have come to expect and love from DreamWorks Animation," said Rob Moore, President of Worldwide Marketing and Distribution for Paramount Pictures. "This new immersive 3-D experience will fully exploit the latest in exhibition technology-and with the March 27 release date, we'll be able to take full advantage by showing it in as many theatres with this advanced 3-D capability as possible." The movie will be directed by Rob Letterman and Conrad Vernon. Letterman was one of the three directors of SharkTale and Conrad Vernon was a director on Shrek 2, both of them DreamWorks movies. Discuss with other fans on the Sci-Fi Movie Page Discussion Board.